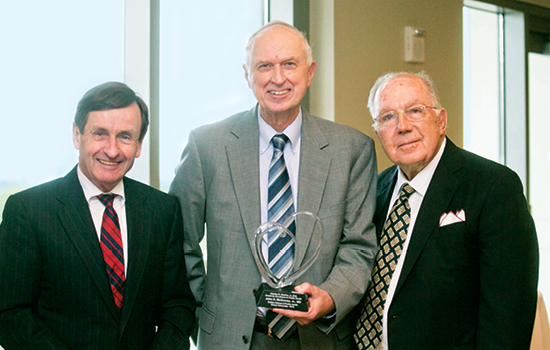 Dean James Curran, John E. McGowan, Jr., and Charles R. Hatcher, Jr.
John E. McGowan, Jr., was awarded the 2014-2015 Charles R. Hatcher, Jr., M.D. Award for Excellence in Public Health. McGowan, who came to Emory in 1973, is a professor of epidemiology and global health at RSPH and a professor of medicine and pathology in the medical school. His contributions include extensive teaching and mentoring activities; directing the MD/MPH dual-degree program; codirecting the masters of science in clinical research training program for junior faculty, fellows, and medical students; serving as a senior advisor for the Emory Global Health Institute; and other efforts to build collaborative programs across the Emory campus and beyond. "Our school grew out of the school of medicine, and John has remained a significant bridge between the schools through his teaching and research," says Dean James Curran. The annual award is named for Charles Hatcher, former director of the Robert W. Woodruff Health Sciences Center. Under his leadership, the MPH program was elevated to school status.